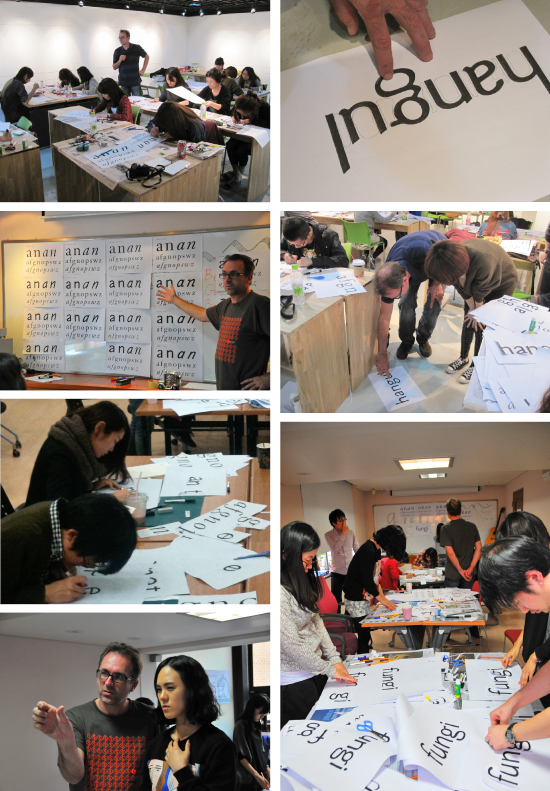 From 17 to 25 October 2010 I was invited to Seoul (Korea) for a series of workshops/lectures on typeface design. 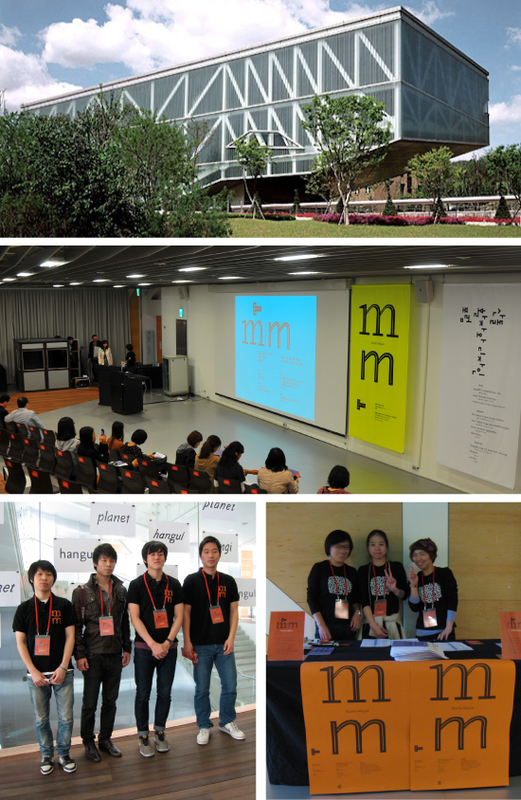 Highlight of the week was the Type & Design Forum 2010 which took place at the Museum of Art (MoA) of the Seoul National University. My work as type designer was the main focus of the event. Many renowned graphic designers and typographers like Karel Martens, Neville Brody and Armand Mevis had been invited in previous years, but it was the first time a typeface designer was invited. The week was organized by Sandoll Communications, one of the biggest type foundries in Korea, in cooperation with the faculty of Design of the Seoul National University and the graphic design duo Sulki & Min Choi, teachers at Kaywon School of Art & Design and the University of Seoul. The first three days of my visit I gave three one-day workshops, all for a different group of students. The goal of these workshops was to confront the students with some aspects of western type design, with a focus on sans serifs. I introduced the method of making a sans out of a serifed typeface, and I supported the workshops with a lecture on my hate for Helvetica. I handed out A3 prints of classic typefaces like Bembo, Garamond, Baskerville and Bodoni, in both roman and italic. In the first step the students were to use white correction fluid and markers to create sans versions of the letters ‘a’ and ‘n’ of these classic typefaces, just by eliminating the serifs and adjusting the contrast. The second step was to create additional characters to be able to make a word. 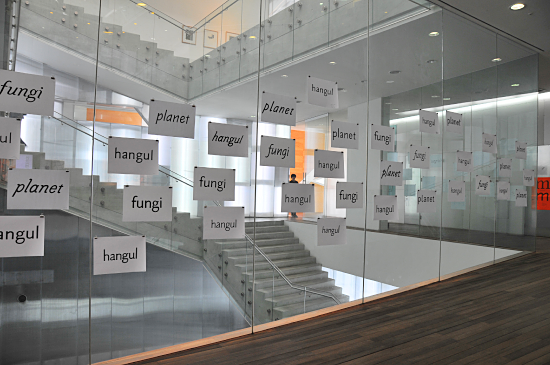 The students at University of Seoul made the word ‘hangul’, the students at Seoul National University made ‘planet’ and the people of Sandoll Communications made ‘fungi’. At the end of each day the results were evaluated, but this was of minor importance. For the Korean students the ‘physical’ contact with western typefaces was much more valuable. The three workshops produced a lot of paper. Computers were not allowed. On Friday, during the Type & Design Forum 2010, the results of all 39 students were exhibited on a glass wall at the Museum of Art. It was a nice composition of interesting type designs, especially bearing in mind that these western shapes were designed by Korean students. The words hangul, planet, fungi contain a lowercase ‘n’, an ascender and a descender. 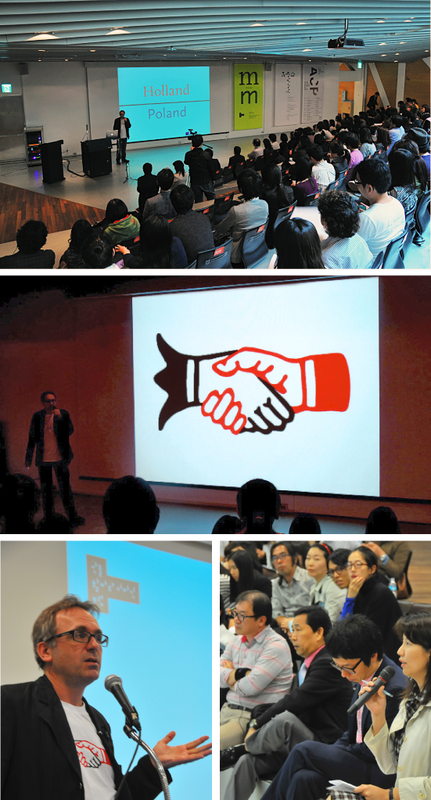 The forum took place on Friday October 22, 2010 at the Museum of Art (MoA) of the Seoul National University. My work as a type designer was the main focus of the event. The reception was overwhelming: Sulki & Min Choi had designed an interesting identity for this forum, using the two characters ‘m’ of Scala and Scala Sans. It was applied in different colours on posters, invitations, identity badges, a website and a huge banner that was hanging in the lecture hall. This all made me very gratified. The venue of the forum: Museum of Art (MoA) of the Seoul National University, a building designed by my fellow-countryman Rem Koolhaas. 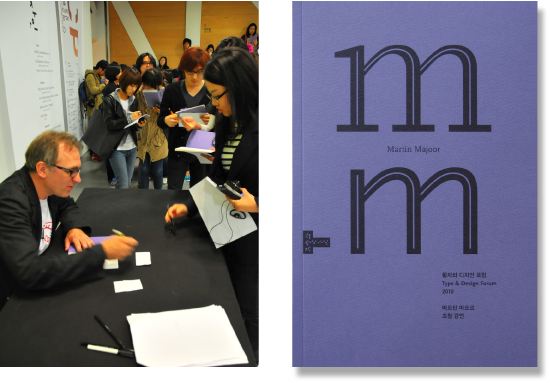 The assisting students were wearing shirts with the m|m logo, designed by Sulki & Min Choi. The introduction words were given by Geum Ho Seok, founder of Sandoll Communications and Lee, Soon Jong of Seoul National University (faculty of Craft and Design). Then the stage was given to Prof. Min Choi, teacher at the University of Seoul. In 2002 he had studied at Yale University School of Art in New Haven (US) and was later a design researcher at the Jan van Eyck Academy in Maastricht (NL), for whom he designed their website. He had met Karel Martens, who had been my teacher at the Arnhem Art school back in the 1980s. In 2003 Min Choi lectured at Werkplaats Typografie in my hometown of Arnhem. Min Choi’s opening lecture was titled ‘Scala on My Bookshelves’. He told about his numerous encounters with Scala and he showed images of the books from his bookshelves that were set in Scala. He talked about the Best Books competition in The Netherlands (at one point in the 1990s Scala was the most used typeface in this competition) but he also showed some very interesting examples of Scala in use that I had never seen before. Min Choi, showing an old issue of I.D. magazine, in which FF Scala had been used. After this fine talk I came on stage for my lecture ‘Two worlds – my life as a type designer’, in which I talked about the different worlds I live in. Worlds of serif versus sans, paper versus computer, roman versus italic, Holland versus Poland, traditionalism versus modernism, etc. On the last slide I showed the image of my handshake-logo (the same that can be found on my website), symbolizing the friendship between all these worlds, rather than its rivalry. After my lecture I was glad to answer many good questions from the attentive audience. Certainly one of the new worlds that has come into my life is the world of Korea. It is the country where printing with movable metal type was invented – long before Gutenberg. It is also the place with its own and unique Hangul script, probably the first writing system that was actually designed. For a type designer like me this is indeed an interesting new world. Now that I have visited Korea I like very much the idea of shaking hands with its culture and sharing experiences. After my lecture the best had yet to come: everybody had received a copy of a beautiful 32-page booklet that was simply titled ‘Type & Design Forum 2010’. Jiwon Yu – senior research manager at Sandoll Communications – was the driving spirit behind the whole project and she had made every effort to print it. Together with the students of Seoul National University she had translated, edited, composed and designed this bilingual booklet in which the text of ‘My Type Design Philosophy’ had been translated into Korean. The booklet: on the left pages the English text, on the right pages the Korean text. Unique in this booklet is the fact that all of my typefaces have been printed in text: FF Scala, Telefont, FF Seria and FF Nexus. It is the first time that these four typefaces have been brought together in one publication. The cover design was done by Sulki & Min Choi, using the same two characters ‘m’ of Scala and Scala Sans as used on the poster. After the lecture most visitors took the trouble waiting in line for me to sign their copy of the booklet. The cover of the booklet was designed by Sulki & Min Choi. It had been a fabulous week so far, the workshops, the lectures, the forum. But I had still two days left for some cultural activities. There were two Korean inventions I was especially interested in: the invention of printing with movable metal type and the creation of the Hangul writing system. In Europe we are proud of the invention of Joahannes Gutenberg, the first European to have used movable metal type around 1450. But in Korea there are books from around 1240 which already make mention of printing with movable metal type. This is more than 200 years before Gutenberg. Left: beewax types for making moulds. Then metal was poored into the mould. Right: the oldest existing Korean metal type (only one character was found) from the Goryo Dynasty (918~1392). It is preserved at the National Museum of Korea. The oldest known physical proof of printing with movable metal type can be found in a Korean Buddhist book called ‘Buljo Jikji Simche Yojeol’. It is preserved in the collection of the National Library of France. The book is nicknamed ‘Jikji’ and it was printed in 1377. This is still almost 80 years earlier than Gutenberg’s 42-line Bible. 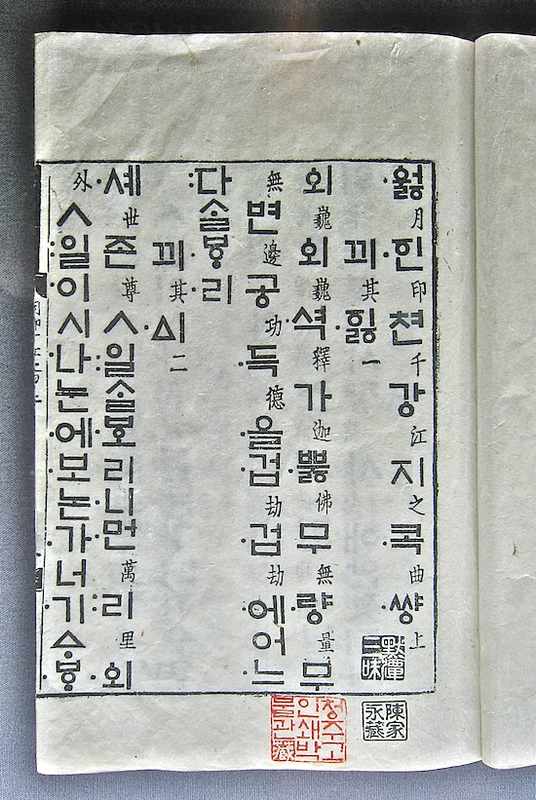 The writing system in the ‘Jikji’ book is Chinese, but the method of printing is Korean. The metal types that were used for this book are lost, but the imprint on paper will always remain. 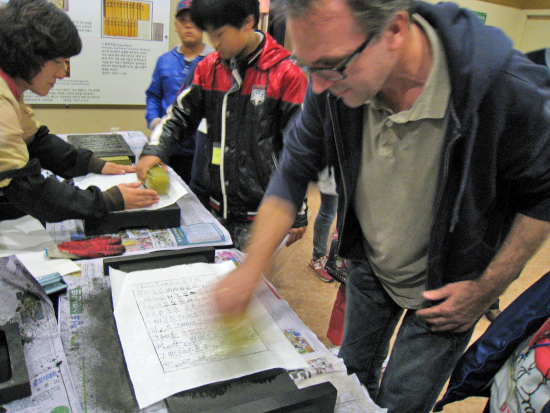 Using chopsticks for composing movable metal type in Korea. This is how it could have looked like in the year 1377. Early Printing Museum in Cheongju. The last page of the ‘Jikji’ book records the time, location and method of its printing. The location that is mentioned is a temple by the name of Heungdeok. Only in 1985 the remains of this temple were found in the city of Cheongju, some 100 km south of Seoul. Part of the temple (only the main building) was reconstructed and the Cheongju Early Printing Museum was built next to it. The museum is worth visiting, I learned a lot about the way Korean metal type was casted, composed and printed. I even could make a print of my own. Printing (or rather rubbing) a page from movable type. This is how it could have been in 1377 (except for the clothes I am wearing). The year 1443 marks another great achievement of the Koreans: King Sejong the Great in that year created Hangul, a whole new alphabet that nowadays is the national writing system in both South Korea and North Korea. “The common people are the foundation of any country. It is only when this foundation is strong that a country may be stable and prosperous”. In 1420, in one of the buildings of the ‘Gyeongbokgung’ palace complex, King Sejong had established the ‘Halls of Worthies’ (Jiphyeonjeon), a sort of think tank in which about 20 of the best Korean scholars did research in many different fields. In 1443 this also became the birth place of Hangul. Three years later, in 1446, the book Hunmin Jeongeum was published in which Hangul was proclaimed (Hunmin Jeongeum means both the first official name of Hangul and the name of the book). Left: during my stay there was an exhibition on the Hangul writing system in one of the reconstructed buildings of the ‘Gyeongbokgung’ palace complex. On this very location in 1443 Hangul had been developed by the king and his scholars. 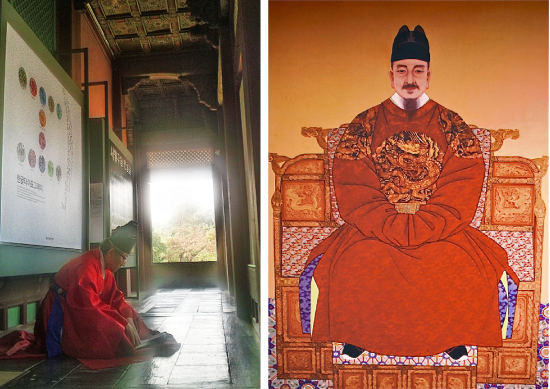 Right: King Sejong the Great. Most of Korea’s (male) elite did not accept Hangul as their new writing system. They scrupulously sticked to the Chinese writing system. But in the mean time other groups that officially had been kept away from learning to read and write, profited from the invention of the easy-to-learn Hangul: peasants, lower classes and especially women. Gradually most Korean people started to use Hangul and a growing number of books were published in it. Finally in 1894 Hangul became the official Korean writing system, about 450 years after its introduction. Four years after King Sejong had created Hangul, he had it cast into movable brass type. The book ‘Wolin-cheongang-jigok’ was printed in 1447 using these large brass Hangul types alongside the smaller Chinese type. At first sight Hangul looks like a simplified version of Chinese, but in fact it is something totally different. It is not a pictographic or ideographic writing system like Chinese, instead Hangul is a phonemic 28-letter alphabet, and just like in the western european languages it makes use of vowels and consonants. One specialist in Hangul is Jiwon Yu. Not only she organized most of my stay in Seoul, she also arranged visits to museums and other places of interest. Of all Koreans she is probably the one person to show something of the Hangul writing system. From 2003 untill 2008 Jiwon Yu had been studying in Germany at the Hochschule für Grafik und Buchkunst in Leipzig. Her amazing thesis about Hangul is an elaborate study of the cultural context in which this script came into being. In her text she even leaves the door open for future developments of Hangul, something I would be happy to take part in. My name in Hangul. It is the first (and last) time I have used Arial. On the last day of my stay I visited the Tium Hanguel Museum, a small but lovely museum near the border of North Korea. I was personally guided around by Jiwon Yu and by the founder of the museum Geum Ho Seok, the same man behind the Sandoll Communications company. Together with the people of Sandoll Communications, shortly after my lecture. On my right Geum Ho Seok, on my left Jiwon Yu. The T-shirt I am wearing with my handshake-logo was Jos Buivenga’s present for my 50th birthday. Jiwon Yu for her endless efforts in making the forum a success and for guiding me through Seoul. Geum Ho Seok (Sandoll Communications Inc.) for inviting me and for being a friend. Seoul National University (Kyungsun Kymn) for inviting me. Sulki & Min Choi for inviting me and for their great contribution of the forum’s design. The students of the workshops for their dedication in designing western type. Typography club Ga of Seoul National University for for their help at the forum. The people of Sandoll for their kind hospitality and their help at the forum. 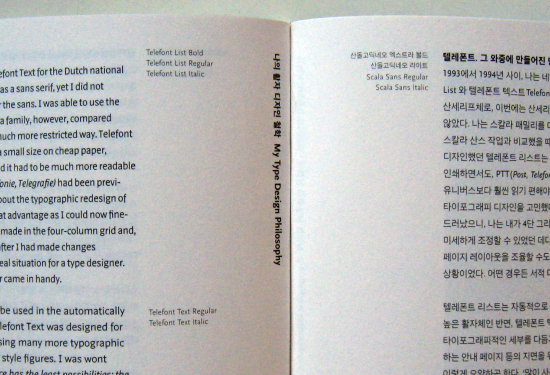 The Fontclub (Young Wha Kil) for making my texts available in Korean and for photographing. All other people who contributed and made my visit to Korea to a success.